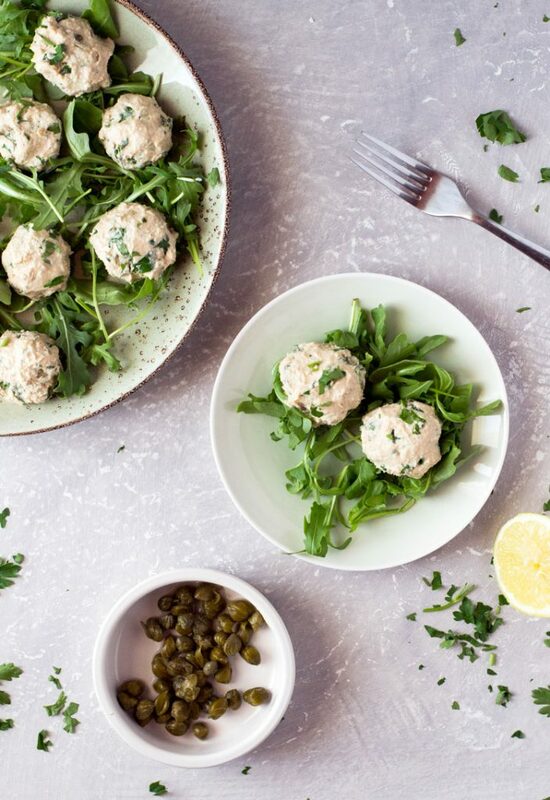 Delicious tuna balls made with ricotta, lemon, capers, and parmesan. A perfect Italian appetizer that’s ready in no time. Hi, I’m Emily and I’m so happy to be a contributor here at All She Cooks. I blog over at Inside The Rustic Kitchen where I create and share lots of delicious Italian food from my little kitchen in Tuscany. I’ll be sharing lots of Italian-inspired and authentic dishes for you here too on ASC over the next few months. 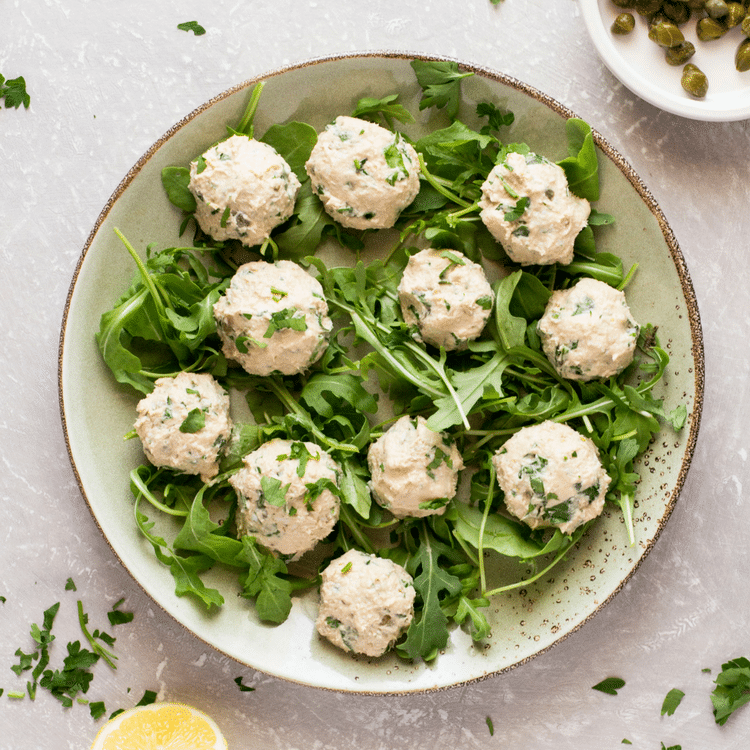 First up are these yummy Italian Tuna Balls with Lemon and Capers. Delicious little bite-sized appetizers that are perfect for entertaining or snacking on. The Italians are very big on their appetizers or aperitivi and these tuna balls seem to make a regular appearance. If they are not shaped into little balls this tuna mixture is often stuffed into small, pickled peppadew peppers or spread on crusty toasted bread to make crostini. The tuna mixture is very simple and easy to make. All you need to do is blend together, tuna, ricotta, hard boiled eggs and a little salt and pepper in a food processor until smooth. Mix in some chopped capers, lemon zest, parmesan, parsley and basil and voilá, it’s done. Shape the mixture into the tuna balls using wet hands a spoonful at a time. I like to make them into little bite-sized balls. Then place them in the fridge to firm up for at least one hour, remove them from the fridge right before serving. I like to add a little arugula on a plate to serve along with some olive, cheeses and cold meats such as prosciutto, salami or ham. Pour a glass of Prosecco and enjoy! 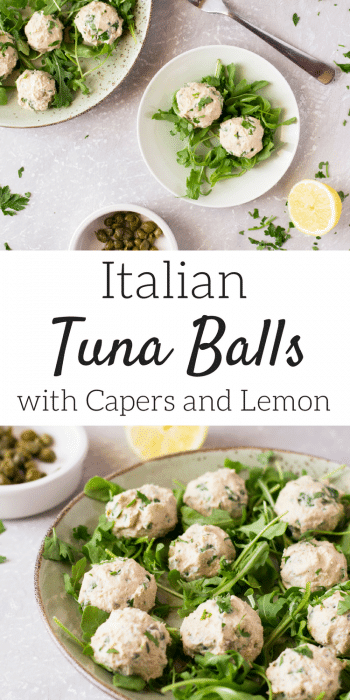 Italian Tuna Balls with Lemon and Capers. A great, easy and delicious Italian appetizer that's ready in no time. Add the eggs, tuna, and ricotta to a food processor and blitz until smooth. Mix in the capers, lemon zest, parmesan, parsley, basil and a pinch of salt and pepper. 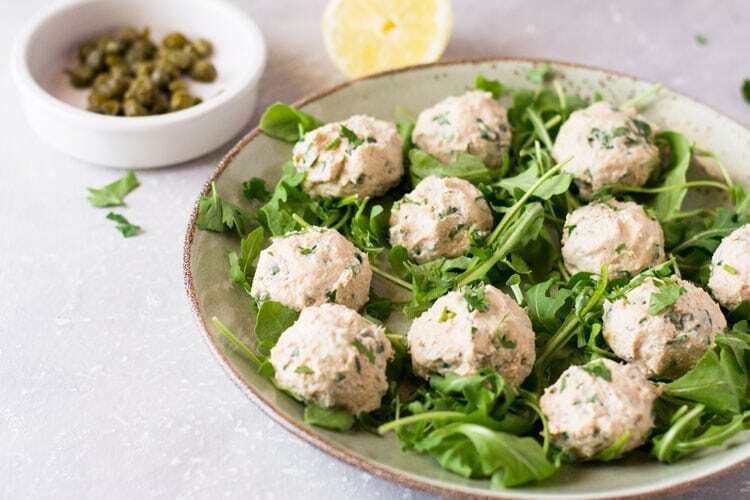 Using wet hands form the tuna mixture into little bite-sized balls and set aside on a plate. Place the tuna balls in the fridge for at least one hour. Remove from the fridge right before serving. 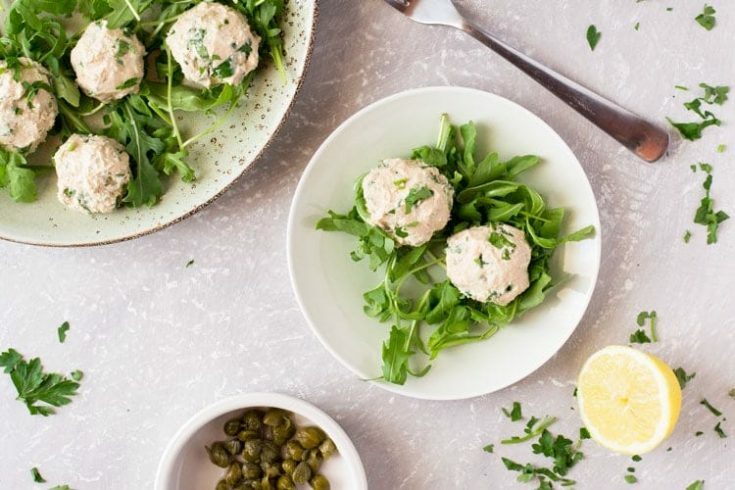 Place a small handful of arugula on a plate and arrange the tuna balls on top, serve. Requires one hour chilling time.